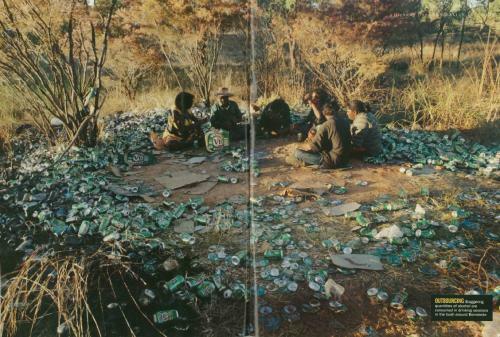 Aboriginals consume vast amounts of alcohol in the outback. Ah the graceful native peoples of Australia. They make Native Americans look like aristocrats by comparison. God I love my country, the Aborigines seen here are much different to the ones we have in the city. The ones we have in Brisbane like to frequent Musgrave Park, you can tell the Musgrave Park Aborigines by their distinctive silver lips, they achieve this by huffing silver spray paint. Although there is a similarity between the pictured Aborigines and the ones in Musgrave Park and that is their camp. Racist pigs like you piss me off. I know a lot of people who are of native descent, one of my best friends is, and they are nothing like this. There may be problems in the northern communities, but there are problems with the white people living there too. Stop living in the past. so THATS wat a corrobooree is like these days…. Sorry XP but the only thing living in the past in this thread is your race card. Being observant does not a racist make. And .00002 % of the population being in some way productive does not excuse the remaining percentage who are utterly useless. Q-delta, why don’t you just move to the American south, where you will fit right in with all the “proper” racist retards we have! And of course, your heritage is so glorious, isn’t it? Proud to be descended from shrimp-dicked, illiterate, murdering, inbred British criminals-good luck to you, shitbird! I have to quit surfing now, the internet is just too stupid today. If you think we’re all “shrimp-dicked” and “illiterate” you’re more racist than I am… I mean really, I’m not bothered by the colour of the boong’s skin, it’s the way they act that shits me. Once again, spending MY money on beer and paint… It wouldn’t matter what colour they were, they’re an embarrassment none the less.